Located along the Sheikh Mohammad Bin Zayed Road, one of the major thoroughfares in the Emirates, the Prime Business Centre (PBC) is home to corporate and commercial enterprises in the Jumeirah Village Circle development. Totalling 17 storeys, the PBC features interconnecting walkways between its two towers, designed to introduce and maximise an in-built area of public space within the building’s core. 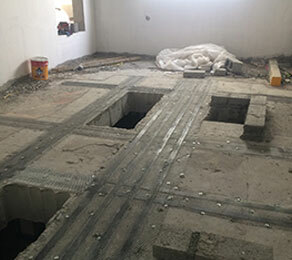 The installation of cable trays and the creation of voids in existing post-tensioned slabs, together with the installation of generators which led to an increased loading, required strengthening works to take place. Prescott (who designed and built the structure) commissioned CCL to provide the design works, post-tensioning review, materials supply, and supervision of the carbon-fibre-reinforced polymer strengthening works. CCL successfully fulfilled its obligations in just three weeks, providing the client with a favourable amount of time with which to complete the installation of electrical equipment.